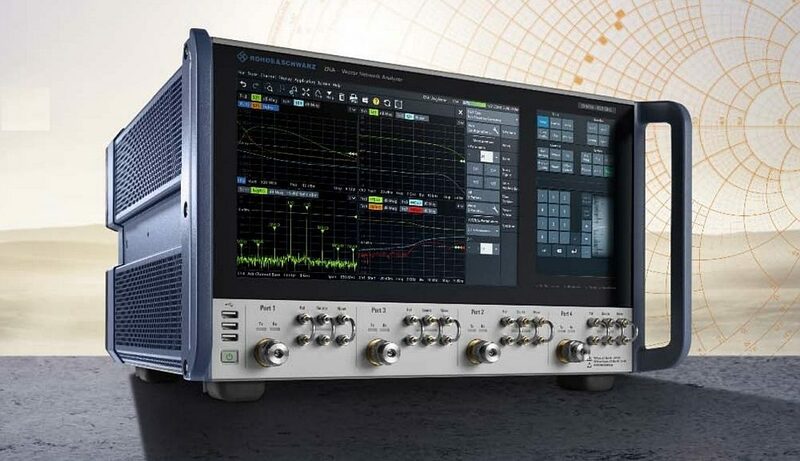 Rohde & Schwarz launches the R&S ZNA high-end vector network analyzer platform with superior measurement characteristics compared to the existing R&S ZVA family. This new generation of high-performance instruments, covering a frequency range of 26.5 and 43.5 GHz, is distinguished by its dynamics of up to 146 dB and trace noise of 0.001 dB at 1 kHz IF bandwidth. Equipped with a touch screen and a touch screen keyboard, these vector network analyzers have features that simplify the configuration of the measurements to be performed on the device under test (DUT). 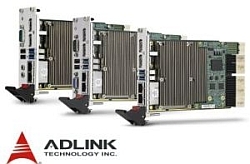 Radar technologies, satellite communications, mobile telecommunications according to the 5G standard or on-board vehicle communications systems require high measurement stability and very low trace noise to meet the measurement requirements of active and passive components and modules. R&S ZNA vector network analyzers have been designed to meet these expectations. 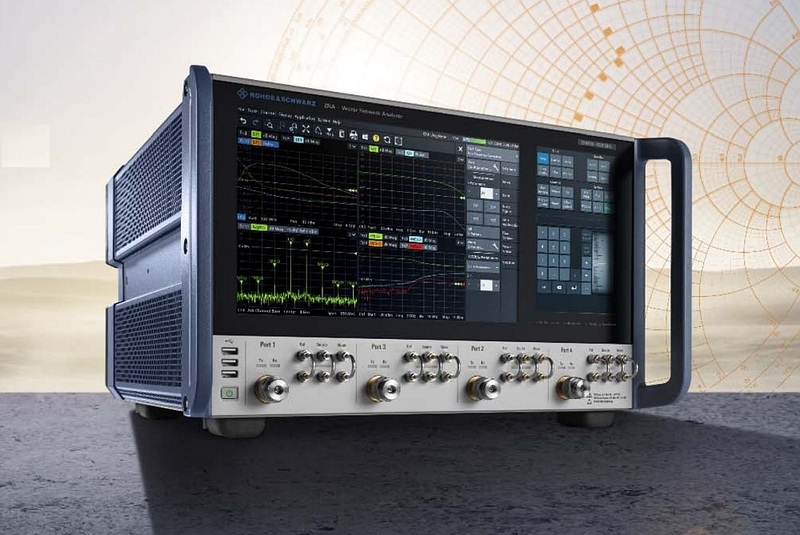 The R&S ZNA family, designed for the characterization of active and passive test components, includes the R&S ZNA26 and R&S ZNA43 models, with two or four ports, and covering a frequency range of 10 MHz to 26.5 GHz and 10 MHz to 43.5 GHz respectively. They have a dynamic range of 146 dB (typ. between 1 GHz and 16 GHz) and a trace noise of 0.001 dB at 1 kHz IF bandwidth. According to Rohde & Schwarz, these two characteristics are particularly suitable for measurements on high rejection filters. The R&S ZNA is equipped with a 12.1″ touch screen combined with a 7″ touch screen keyboard replacing the traditional keys. According to Rohde & Schwarz, this makes it the first fully tactile vector network analyser available on the market. This tactile user interface is combined with a DUT approach to implementing the measures. The user selects the type of component to be tested such as a mixer or amplifier before being guided step by step to implement the appropriate test configuration. “The types of measurements to be performed are expressed in explicit terms for the operator without using complex acronyms,” says Philippe Seurre, product manager at Rohde & Schwarz France. However, users retain the freedom to adopt a conventional approach to configuring measurements. The R&S ZNA vector network analyser from Rohde & Schwarz is equipped with a 12.1″ touch screen and with a 7″ touch screen keyboard. R&S ZNA analysers are capable of performing mixer measurements in parallel in RF and IF. They are equipped with four coherent internal phase sources (two as standard), eight parallel receivers and two internal local oscillators (LO) compared to only one on the ZVA range analysers. 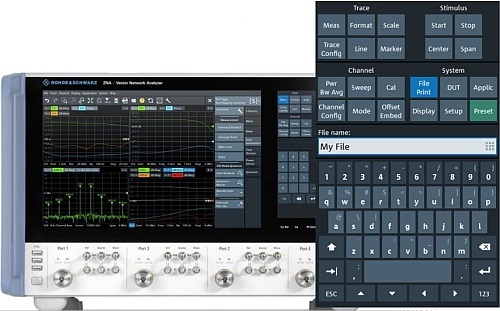 “This simplifies the test configurations used to characterize frequency conversion devices, amplifiers and complex T/R modules. They require only one connection to the DUT. The additional internal sources avoid the use of a generator to be controlled”, reports Philippe Seurre. Users can perform measurements of conversion loss, phase delay and vector correction group loss without the use of a reference mixer. Vector-corrected scalar mixer measurements with full correction of the transmission coefficient do not require a phase reference. Other new features include: a pulse generator can be integrated on each port as well as a modulator, and direct IF access to input and output as well as to internal sources and receivers. The R&S ZNA analyzers also allow the characterization of an amplifier with a power sweep range of 100 dB. They also offer intermodulation measurement and spectral analysis functions. “The architecture of a vector network analyzer is not natively adapted to spectrum analysis. We have therefore integrated spectral analysis tools that make it possible to avoid image frequencies and other intermodulation products,” explains Philippe Seurre. Finally, in addition to the traditional communication interfaces (USB, GPIB, Ethernet LAN), the instrument houses an extractable SSD hard disk on its rear panel.